Button-front mini skirts are crazy trendy right now, and we’re especially obsessed with the corduroy variety. This ’70s skirt style is so versatile and can easily either be dressed up for a night out or worn more casually to class. Keep reading see some ways you can style a corduroy mini for both class and a night out. Now it’s time for extras. Some studded cognac booties will look great with the burgundy color of this skirt. Next, add a brown messenger bag, like this one from Target. It’s perfect for carrying all your classroom essentials while still complementing your outfit. Finish off this confident look with a dash of red lipstick and a touch of glittery brown eyeshadow. Perfect! A daring off-the-shoulder top will make your outfit more formal for that party you plan on heading to after class. With some bold black and gold accessories and a matching chic chain strap clutch, you are ready to go for a night out with a look that will turn heads! Plus these peep toe heels from Lulu’s are a must-have. The block heel makes them comfy and adds to the throwback vibe of the look. 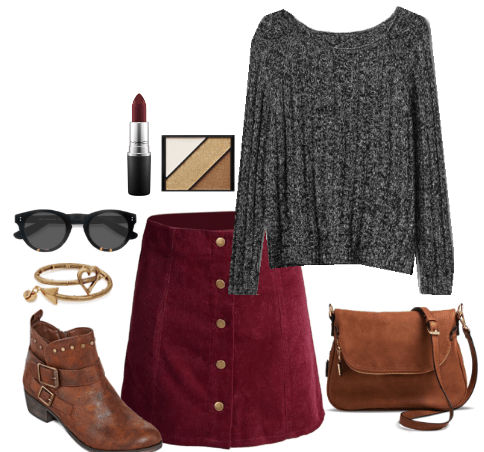 Do you like corduroy mini skirts? Would you wear one? How would you wear it? Let me know in the comments below!